The open cluster NGC 2100 shines brightly in this new photo from the European Southern Observatory's New Technology Telescope in Chile. The cluster stands against the backdrop of brightly glowing colored gas from the Tarantula Nebula. 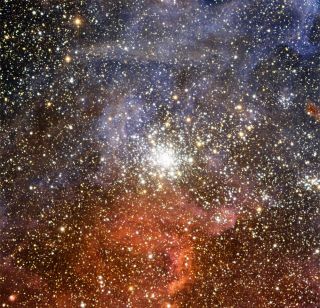 A group of 15 million-year-old stars shines in a rainbow of colors from blue to orange in a new star cluster photo snapped by astronomers using a telescope in Chile. The photo was taken by the New Technology Telescope at the European Southern Observatory's La Silla Observatory, high on a mountain in Chile's Atacama desert. The center of the cluster is dominated by massive, bright-shining stars, while lightweight stars tend to hover around the outer regions. The stars in open clusters such as NGC 2100 are thought to have formed at about the same time, from a single large cloud of gas and dust. Clusters like this tend to survive for tens to hundreds of millions of years, until they dissolve as more and more stars are stripped off by gravitational interactions with larger objects, such as nearby galaxies. NGC 2100 is located about 160,000 light-years away in the Large Magellanic Cloud, which is itself a smaller satellite galaxy of the Milky Way. NGC 2100 must share the limelight with its other neighbor, the nearby Tarantula Nebula, so-named because its filaments of colored gas resemble the legs of a giant spider. The bright blue and red glow in the background of the new photo represent ionized oxygen and hydrogen gas, respectively, from the outskirts of the Tarantula Nebula.